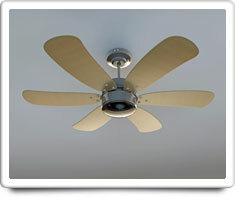 Ceiling Fans have an electric motor that drive flat blades that move air when the blades rotate. Some models of Ceiling Fans have light fixtures integrated with them. And most models allow the direction of the rotation of the fan blades to be changed. Over time, ceiling fan blades can become out of balance, which causes them to "wobble" when they are operating. An out of balance ceiling fan can usually be easily adjusted with a kit available at most hardware stores. Central Air Conditioning and Room Air Conditioner. Shown in the 'Routine Care' section are the recommended routine maintenance tasks for your ceiling fans. The 'Q & A' section shows answers to common questions. And the 'Articles' section provides helpful articles about your ceiling fans.